It was an amazing five-days spent in Ireland. It wasn’t my first time here but this trip certainly was something different. First stop Dublin airport from Rome. Then the drive to Derry in Northern Ireland which is where the Carnage Warrior Retreat Day was taking place at my friends gym called Strike. We had a great turnout from the crew in Derry. We had a few solid hours on the mats striking, before I taught them all there first yoga and meditation class. Certainly something that they had never experienced. The afternoon we went to visit some of the historic places in Derry, which is full of history. But unfortunately not very nice history, as the town has suffered a lot of fighting over the borderline between the UK and Ireland. A lot of unhumane treatment was taken place over the years before us in the town of Derry. Seems to be at peace in this current moment, but I’m sure a few old grudges hold deep. After Derry weekend it was back up to Dublin for a motivated speech night. The Warriors Journey 2 was delivered in Dublin city to a small crowd of amazing men and women that all enjoyed the evening event. Talking about the “never give up mindset of a champion”, but how we in life need to apply the same attitude. 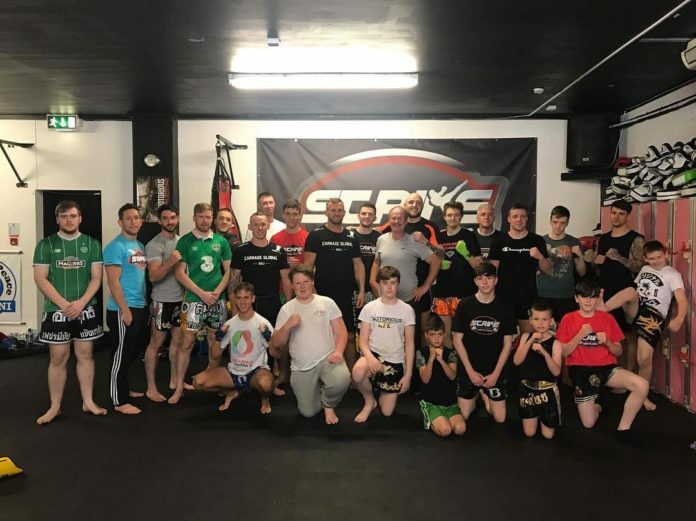 A second night of teaching took place at South Dublin Muay Thai Academy. I had the pleasure to work with a small group, including few youngsters, teaching them the Art of Elbows. Dublin city is alive and full of people. It was my first time getting to spend time here and look around, going to the famous Guinness factory, and had a tour learning all about the dark Rudy red drop called Guinness. Thank you Ireland. Now it’s time to leave for the USA and work our way across the country from the West to East Coast teaching and inspiring many.